Add this high quality Safavieh Courtyard area rug to your home for an instant splash of style. Designed to decorate an indoor/outdoor space, this plush synthetic material rug is high quality. This machine-made rug makes long-term decorating easy. Bring this floral plants patterned grey rug into your living spaces for a contemporary design aesthetic. 8 ft. 11 in. X 12 ft. This Safavieh Courtyard area rug is sure to make a statement in any room of your modern home. This indoor/outdoor piece is made from plush synthetic material, which is high quality and high fashion. Its machine-made construction is sure to endure the constant treading of feet and furniture. Quality is assured with this geometric patterned blue rug. Improve the overall interior design of your living room, dining room, or hallway with this Safavieh Courtyard area rug. Add this indoor/outdoor rug to your home for a comfy, yet stylish design option since it is made from plush synthetic material. Contemporary comfort comes in the form of this machine-made rug. Quality comes first in this geometric patterned grey rug. Interior design made simple with this contemporary Safavieh Courtyard area rug. Designed for your hallway, dining room, or living room, this indoor/outdoor piece made from plush synthetic material looks and feels great. Make a lasting style statement with this machine-made rug. This geometric patterned grey rug makes a bold statement in your hallway, dining room, or even living room. Courtyard Marc Grey / Natural 8 ft. 11 inch x 12 ft. Indoor/Outdoor Area Rug Add this high quality Safavieh Courtyard area rug to your home for an instant splash of style. Designed to decorate an indoor/outdoor space, this plush synthetic material rug is high quality. This machine-made rug makes long-term decorating easy. Bring this floral plants patterned grey rug into your living spaces for a contemporary design aesthetic. 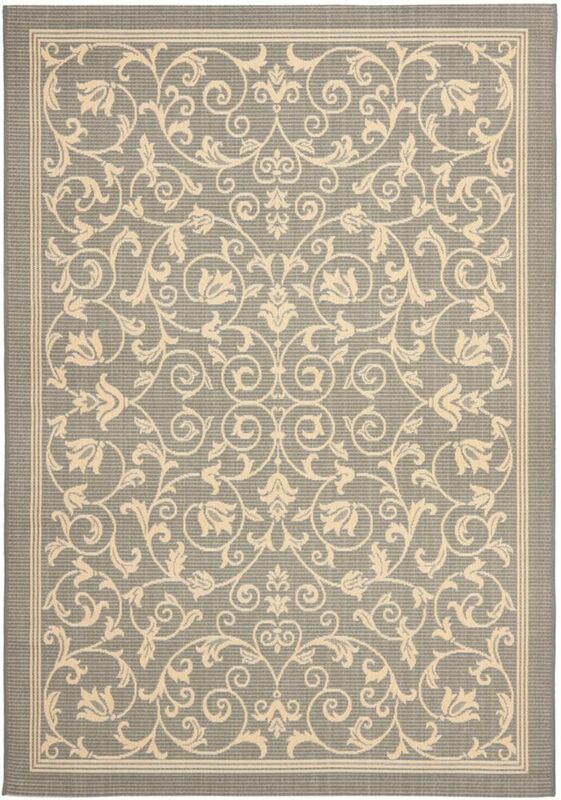 Courtyard Marc Grey / Natural 8 ft. 11 inch x 12 ft. Indoor/Outdoor Area Rug is rated 4.0 out of 5 by 1. Rated 4 out of 5 by Margie from It's really nice looking in the room Wasn't sure I liked it at first, but everyone in the family did--so I gave it a chance and have grown to like it in the room. It's and indoor/outdoor rug, which I didn't realize when I ordered it, but I don't mind that now. The only thing I don't like is that it's taken a few weeks for the wrinkles to come out..still waiting for it to be completely flat!